We detected an earthy/musty off-flavor in the flesh of red sea bream Pagrus major cultured under low saline water conditions using two types of recirculating aquaculture systems (RAS). The compound causing the off-flavor was identified, and we investigated how the ultraviolet (UV) equipment of the RAS affected the concentrations of off-flavor compounds in fish flesh and rearing water. Odor intensity was lower in the muscle of fish from RAS equipped with a UV device (UV+) compared to RAS with no UV device (UV−). In total, 107 volatiles were identified in the muscles of fish from each RAS and sea cage (control) by gas chromatography–mass spectrometry. The volatile compounds previously reported to be responsible for the off-flavor were not detected. The odorous compound that caused the off-flavor in red sea bream flesh from both of the RAS was identified by gas chromatography–olfactometry as 2-methylisoborneol (2-MIB). The concentrations of 2-MIB in the fish flesh and rearing water were lower in UV+ compared to UV−. 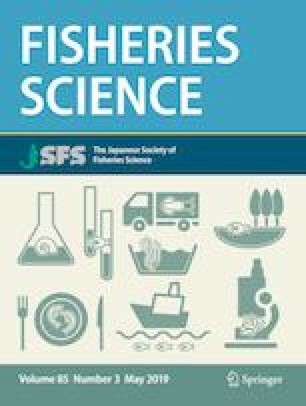 In conclusion, the problem of an off-flavor in marine fish reared in RAS-type temporary rearing tanks with diluted seawater will likely increase as more marine fish species are reared under these conditions. The online version of this article ( https://doi.org/10.1007/s12562-019-01307-1) contains supplementary material, which is available to authorized users. This study was supported in part by the Science and Technology Research Promotion Program for Agriculture, Forestry, Fisheries and Food Industry (28017B) and the Bio-oriented Technology Research Advancement Institution, National Agriculture and Food Research Organization Japan (Research Program on the Development of Innovative Technology, 28017B).